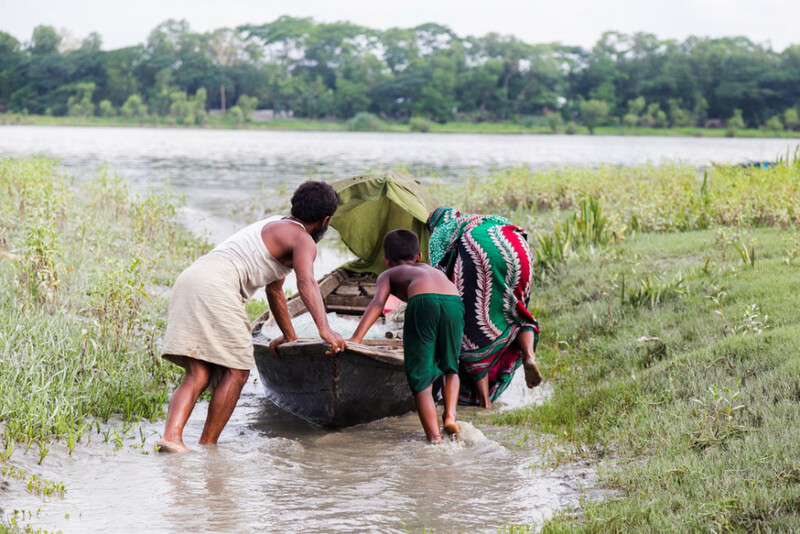 A family pushes its fishing boat toward the Golachipa River through a small channel, Golachipa River, Patuakhali, Bangladesh. Photo by Md Masudur Rahaman. Galachipa, an offshore valley in the southern part of Bangladesh, often faces natural hazards like flood, river erosion, and tidal surges. They were used to with such acts of nature until 2007 when a devastating cyclone, named Sidr, has swept the area along with many other villages in the south that killed up to 10,000 people, according to the Red Crescent Society. Millions of people have lost their belongings on November 15 of the year due to the cyclone. The remote islands of the area turned into valleys of death immediately after the storm. Surjabanu lives very adjacent to Agunmukha river, which is known as one of the dangerous rivers in the country due to its unstable nature most of the time of the year. As a member of a fishermen’s community, Surjabanu’s life is very much dependent on the river. Her father is a fisherman. Due to the poor family condition, she was not able to go to school in her early life. Rather, married to a man named Habibur Rahman, when she was a teenager. Her husband was earning 50 cents a day at that time as a helper of a Fishing group. After Cyclone Sidr, Surjabanu’s life became harder as her family lost everything they had. However, a non-government organization came forward to help her. It has provided her with three microloans to survive and return to the normal life. Surjabanu bought a new engine boat and fishing net for her husband using the money. She and her family have got a new life with the small help of microfinance program. Surjabanu is not alone. Some other climate victims have changed their lives through supports from non-government organizations as well. Unfortunately, many people still need help. We are working for them.Please donate to keep us going!